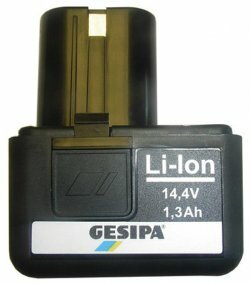 Li-Ion 14.4V 1.3Ah Battery suitable for the Gesipa Accubird rivet tool and Gesipa Firebird rivet nut tool. This battery will also suit the POP MCS5800. NOTE:- DUE TO CHANGES WITH INTERNATIONAL AIRFREIGHT POLICIES, THIS PRODUCT IS NOW CLASSED AS "HAZARDOUS GOODS" IF ORDERED ON ITS OWN AND WILL BE SUBJECT TO HIGHER FREIGHT CHARGES. PLEASE CHECK WITH US BEFORE ORDERING IF YOU ARE OUTSIDE OF THE UK OR EU.